This is a practical car and is also very economical. 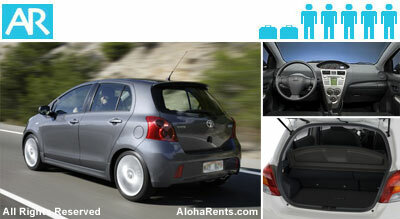 We were surprised to find that the Toyota Yaris is a 5-passenger vehicle. With a standard 1.5-liter, I4, 106-horsepower engine that achieves 34-mpg in the city and 40-mpg on the highway. Equipped with a 4-speed automatic transmission. This car has air-conditioning, automatic transmission, Height adjustable driver seat, power steering and brakes, 2 doors, A/C, AM/FM stereo and cd player.